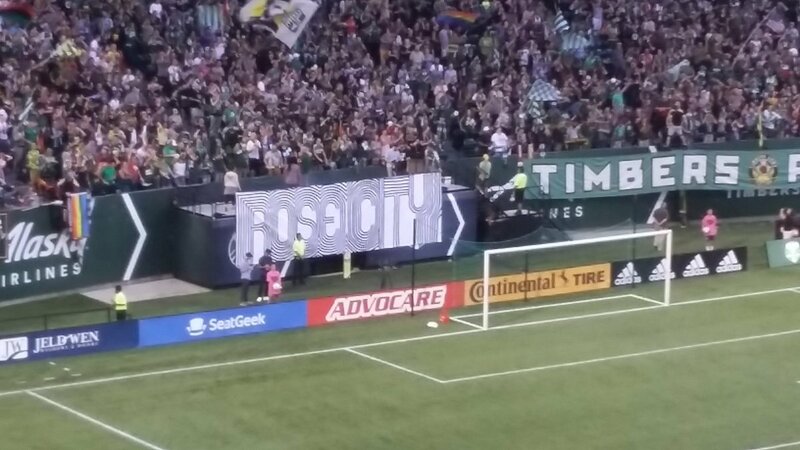 The Timbers Army have a new banner each match. I like this one a lot. Everybody who knows me well knows my absolute devotion to the Simpsons, one of the greatest television shows in the history of the medium. While many will debate the quality of the recent era of episodes or have allergic reactions when a certain character is featured, I never miss an episode in the current run. I can appreciate a television show that not only provides several hysterical moments, but it has also provided wonderful amounts of insight. I've even read books about the philosophy and religion of the Simpsons because the subject interests me, and it isn't due to me having a hysterical moment with Timbers beat writer Matt Hoffman about Kent Brockman calling a game of soccer in Springfield, either. But there is a Simpsons line that probably best describes the 90 plus minutes of game tactics between the Portland Timbers and Colorado Rapids on August 23: "We must move forward, not backward; upward, not forward; and always twirling, twirling, twirling towards freedom!" Okay, the line was uttered by Kodos on the campaign trail disguised as Bill Clinton, but honestly, it was the most apt description of the Timbers approach to the match - a literally random attack that didn't seem to make sense at points, but somehow, they did enough to secure a needed victory by a 2 to 1 count before their upcoming 3 match road trip that starts this weekend with a visit to Flounder land. Timbers Coach Caleb Porter has been dealing with a lot since the Timbers were dismantled in Toronto back on August 12, and they followed that up with a gut check win over the New York Red Bulls on August 18 that was nail biting until the final moments. Porter has been dealing with injuries to Marco Farfan (lingering ankle sprain), Liam Ridgewell (injured late versus the Galaxy), Jake Gleeson (hurt during Toronto) and Fanendo Adi (injured in Galaxy match), but he also needed to adjust to the loss of Larrys Mabiala to a red card infraction late in the Red Bulls match. With Jeff Attinella making his second consecutive start in goal, Porter employed Zarek Valentin and Vytas as the fullbacks with Lawrence Olum and Roy Miller as the center backs. Defensive midfielders David Guzman and Diego Chara again started, but both were close to invoking a one match suspension for accumulation that could keep them out of the next match with Guzman 1 away from penalty and Chara 2 away. Darlington Nagbe, Diego Valeri and Sebastian Blanco would again be the attacking midfield trio, but in switching up the plan, Porter gave Darren Mattocks the start instead of Jeremy Ebobisse, although both have been playing regularly with Adi still recovering. Ebobisse was joined on the bench by goalkeeper Kendall McIntosh, defender Alvas Powell, midfielders Amobi Okugo, Ben Zemanski, Dairon Asprilla and Victor Arboleda, so the Timbers had options available if needed. 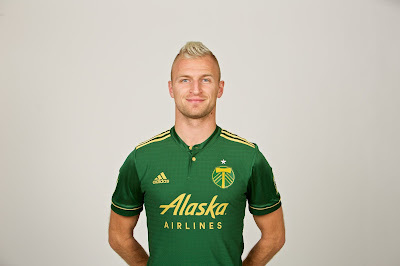 Say hi to the Timbers' all time franchise leader in goals scored. Colorado has been in a tailspin all season to the point that the coach who led them to the conference semifinals last year, Pablo Mastroeni, was relieved of his duties on August 15th and replaced with assistant Steve Cooke. Defense and goalkeeping continue to be reasonably good for the Rapids with Tim Howard and Zac Macmath in goal and just allowing 32 goals in 2017, putting them in the middle of the pack in the West. The issue for the Rapids is in their offense, as they've just scored 22 goals on the season, just ahead of the anemic offense of D.C. United. It's not that the Rapids don't have some intriguing options up top with forward Kevin Doyle, midfielders Dominique Badji, Marlon Hairston, Michael Azira and recently acquired Mohammed Saeid, but they've simply been unable to find any consistency within their attack at all. Cooke originally unveiled an interesting attack formation with 3 midfielders and 3 forwards in his starting 11 - Azira and Saeid joined by Luis Gil in midfield with Doyle, Joshua Gatt and Dillon Serna up top, but once Colorado took to the pitch, it switched up to a 4 - 4 - 1 - 1 with Doyle playing a lone striker with Saeid providing some channel support. The formation employed was designed to try and slow down the Timbers' attacking tempo by putting 8 players behind the ball in most occasions and countering only if numbers were available, but otherwise, the Rapids' offense consistent of firing long passes forward in the hopes that Doyle or Saeid could run them down. For those Timbers fans from back when, you might recognize this lovely approach by its more common name of Bobby Ball; it's not pretty to look at, but sometimes it did yield results in the ugliness. Portland turned up the tempo early with pressure along the wings, and earned big chances early when Valentin found Valeri on the right in the 13th minute but the Maestro's turn and shoot was pushed wide. Three minutes later, Chara and Mattocks met up on a run to the left, and while Mattocks slipped trying to pass, he did find Valeri who gave Blanco a chance to shoot but Sebastian chipped it over the crossbar. Portland finally broke through in the 21th minute when Vytas put a pinpoint cross into the box where an unmarked Valeri was able to easily head the ball past a helpless Howard to put the Timbers up by 1. The celebration hadn't even stopped for Valeri's 15th goal of 2017 (and his 52nd goal as a Timber making him the all time franchise leader in goal scored) when Nagbe took another cross from Vytas on the right, and he put an incredible spinning chip shot into the upper right corner of goal that curled just inside the post past Howard for a 2 to 0 lead. The Rapids were making things interesting with several speculative runs down the middle, but they suddenly found themselves in a 2 goal deficit with a sold out Providence Park in full road surrounding them. Portland had been very good tempo wise early and they were completing their passes with precision, something that was very much missing in the Red Bulls match, but minutes later, the match took a rather dramatic turn. Thankfully we have a Flounders match where this guy can play. I'm still trying to figure out what Olum was thinking in the 28th minute when he passed in the middle as I never saw his intended target to determine if he put enough force on the pass or if it was actually heading in the right direction. All I saw was that the ball ended up at Saeid's feet, and the Rapids midfielder was able to dribble past Olum, Valentin and Attinella to slot the ball into the goal. and with that, a comfortable 2 to 0 lead was turned into a 2 to 1 scoreline and the nerves went into overdrive. Portland appeared very rattled by the situation, but the mood slightly elevated in the 30th minute when Rapids defender Mike da Fonte took down Valeri in the box with a hard tackle & shirt pull to no call from the officials, prompting Valeri to unleash a tirade at Center Official Dave Gantar. Unbeknownst to the captain, Gantar was talking with VAR Drew Fischer, who had already called for a potential review of the play. Gantar made the square symbol to indicate the review, and after several seconds, Gantar pointed to the spot for a penalty to the consternation of the Rapids. As Valeri settled in to attempt the penalty, a conversation started between Valeri and Guzman that led to a switch in shooters as it was Guzman that lined up to take the restart in the 31st minute when Gantar blew his whistle to restart. Guzman pulled his shot to the left where Howard had moved, but the trajectory pulled the ball wide of the left post and it slid by and struck the nearby ad boards, leaving the score at 2 to 1 Timbers. The Rapids nearly drew level when Doyle struck a well placed shot that challenged Attinella, but the keeper was up to the task. The match soon entered the meandering phase of play for the next few minutes as both sides tried to recover from the previous events, but Portland did get a near miss from Valeri and a blocked shot from Blanco before the halftime whistle. The halftime stats pointed to a dominant Timbers effort with 10 total shots, 67 percent possession, 89 percent passing accuracy and 279 passes attempted; simply put, the offense was firing on most cylinders despite the Rapids bunching their defense behind the ball to clog the box. Even with all the statistical advantages, the Rapids were within a goal due to an unfortunate defensive gaffe and the Timbers were still somewhat reeling from the missed penalty. It would be up to Porter to rally the troops to keep them focused, especially considering what happened the last time these teams met in June in Denver - the Timbers went up by 1 early only to concede 2 goals late to lose another heart breaker in Colorado, as former USL Timber Alan Gordon scored a header in stoppage time to seal the Rapids win. Vytas was my man of the match with 2 assists. He should have had more. One of the issues I did have in the first half was the performance of Mattocks, who simply was horrible in his contributions. While he did get an assist on Valeri's goal, most of the half I watched him mistime shots, fall down when trying to move or simply mishandle the ball with poor first touches. He did get a nice shot in the 52nd minute off a feed from Nagbe after Azira and Nagbe had traded misses. The Rapids were trying to increase their pressure after Doyle had another blocked shot in the 53rd minutes, and they brought on Marlon Hairston and Badji, two of their faster players, for Serna and Gatt. The Timbers attack, meanwhile, was starting to whirl and buffer after Guzman and Blanco had respective misses in the 54th and 55th. The intensity was also picking up as Gantar's whistle was starting to influence some of the action as both sides pushed for a goal to either extend the lead or bring the match level. Porter brought on Ebobisse for Mattocks in the 69th minute, and the youngster had a good shot blocked in the 74th minute, but Attinella had been forced to deal with a corner minutes early where he punched a ball clear from several Rapids players. Cooke also brought on Gordon for Doyle, who has a reputation for petulant acts and late match dramatics, and Gordon earned a couple of fouls within seconds of his inclusion. Guzman, meanwhile, had been warned of his persistent fouling, and Gantar finally carded the midfielder in the 73rd minute thus answering one of the questions many Timbers fans were asking on social media: which Timbers midfielder will miss the Flounders match due to disciplinary action? Chara managed to avoid any additional discipline, but in getting a caution in the 39th minute on a breakaway foul, the diminutive Diego is now 1 caution away from invoking a 1 match suspension. With the Rapids pouring forward, Colorado did get two late distance shots from da Fonte that Attinella dealt with while Blanco had the Timbers' best chance to add an insurance goal in the 82nd minute with nifty footwork in the box to hold the ball and cause several Rapids to fall down. However, Sebastian's final shot flew harmlessly into the South Deck. With the feverish start, it appeared the goals might be flying but neither team was able to add anything beyond the Valeri, Nagbe and Saeid goals, as the Timbers were able to hold on for the result. Please to come back Sunday with 3 points? And avoid the bule! The victory gave the Timbers their 11th win of 2017, putting them in second place in the West at 40 points tied with Sporting Kansas City, and put them 1 point behind the Sounders, who moved up to first in the west with their 1 all draw with Vancouver at B.C. Place. 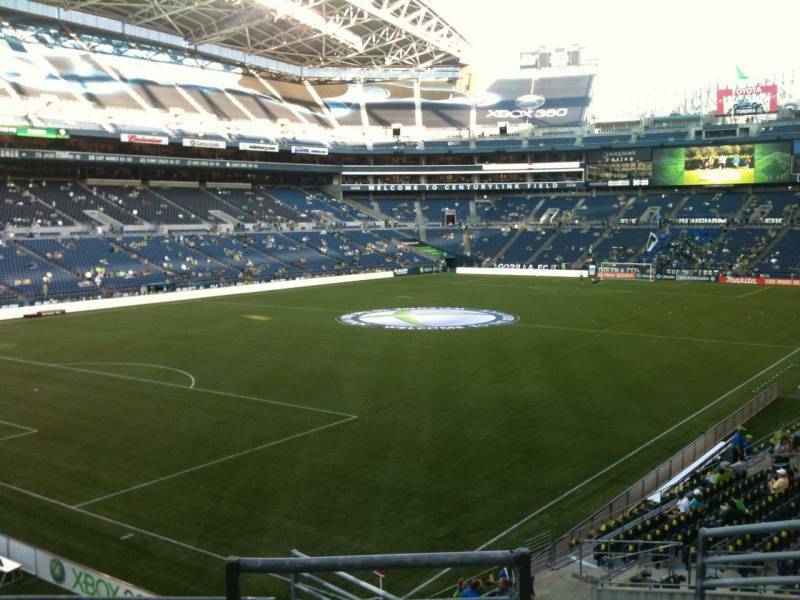 The Sounders are unbeaten in their last 10 matches to propel the defending MLS Cup Champions to the top spot, and the Timbers would love nothing more than to snap the streak and propel themselves upward. Portland will need to find some rhythm in their approach, which might prove difficult with the loss of Guzman. 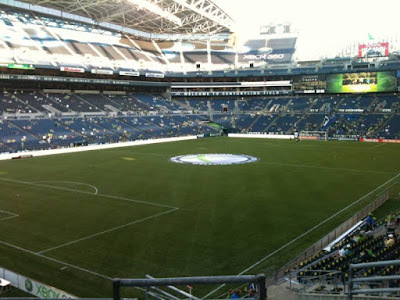 Another concern that came up late was the status of Asprilla, who entered the match for Nagbe in the 79th minute and did very well in some late runs, but ended up fainting after the match during the postmatch celebration. While Dairon was able to stand up and lie on a cart that transported him from the pitch, Porter indicated that Asprilla had been taken to the hospital for precautions after the dizzy spell. Apparently, he had also been battling flu symptoms that had been passing among some players as well, but this is concerning with the status of Adi, Farfan, Ridgewell and Gleeson still unclear. Portland now travels to the Emerald City for a huge Cascadia Cup clash on August 27 before traveling to New York on September 9 for a match with NYCFC, then traveling to Salt Lake for a battle with RSL on September 16. The Timbers' next home match is a month away on September 24 when they host Orlando City, but Portland plays 3 of their last 4 at home and their last trip is still on the West Coast.